Reagan had another good night last night. We're so sleep deprived most of the time it's hard to remember how many times we actually got up during the night. But last night Mike and I only got up once. Reagan woke crying and I had to pick her up to snap her out of it. She finally fell back to sleep and then just as I was crawling in bed, she woke again. I was so exhausted at that point I pushed Mike out of bed and made him go console her (after all she falls asleep easier for him anyway). I guess it worked because I don't remember waking again, that is not until 6am when the alarm clock went off. We were planning on leaving by 6:15am (it turned out to be closer to 6:30) to get to TX Children's for Reagan's procedure. We were there by 7am but they didn't even begin the procedure til 8:30 (apparently her doctor didn't write down a good enough reason to do the small bowel follow through and they had to get approval). They finally took an x-ray, then made her drink the barium and took pictures as it went down. Then they had me feed her some more of it and we waited for it to move all the way down into the colon, they said we would only have to wait 30min but it ended up being closer to 1hr because all of the rooms were full. They took some more pictures and around 10:30 we were finally headed back home (no word on the results, I'll probably give the doctor a call tomorrow). Reagan did pretty well with all of it. She got a little agitated and fussy (of course she was probably hungry), but she never got out of control like the other kids in nearby rooms screaming bloody murder! 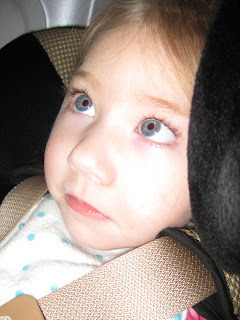 She took a little nap on our drive home and then was awake in time for vision therapy at noon. I wouldn't say she was totally alert, I think she was still tired and her head was a little droopy, but she made it through the whole session and was fairly attentive. One thing her therapist noticed is that her arms/hands seem to be more relaxed (her feeding therapist commented on the same thing yesterday). I wonder if it's related to the Clobazam. It would be nice to finally see some good side effects instead of all the negative ones. Of course, less seizures is always a welcome sight. Please keep that in your prayers! Reagan has been going to sleep much earlier lately, around 9pm instead of 11pm. Usually this would be a bad thing, and she'd wake up sooner rather than later, but last night it worked out just fine. She only woke up once at 1:30am or so and then slept through til 7. It was awesome! I can't remember the last time she woke one time during the night. The sleep must have rejuvenated her because she was a doll all day today. So sweet and talkative, it was a welcome change from yesterday. She took a couple good naps today, but she wasn't groggy like she was yesterday. She only had one therapy today, feeding therapy, and she was great for that too. It's just so strange how she goes back and forth, one horrible day, one great day. Right now I'd settle for just some consecutive so so days. Any stretch of good days usually comes to a screeching halt with those nasty tummy pains. Thankfully today they spared her. And she even had two dirty diapers, but no pain. Another mystery that hopefully we'll get to the bottom of soon. Tomorrow morning is her upper GI with small bowel follow through. She can't have anything to eat or drink after 11:30 tonight. This is checking to make sure that everything is where it should be internally...that nothing is kinked or out of place. If this looks normal, then we'll do the endoscopy/colonoscopy at the end of the month. I would prefer to not have to do that, but we just have to find some answers for her sake. These tummy pains have been making her miserable for way too long. Please keep her in your prayers for a good night's sleep tonight and another good day tomorrow. Last night was a bad one. I'm certainly not counting on the Clobazam to help with sleeping at this point, not based on our experience last night anyway. Reagan woke up a lot. She was very restless, waking probably every hour or so with the yelling, screaming type of crying. Not fun. I woke up this morning feeling like I had been steamrolled. Not sure if it's the new med or what but Reagan's been in a strange mood all day. Very irritable. Lots of moaning and fussing directly at me. Very hard to tolerate, especially on no sleep. We had plans to go see a few houses today, so my mom came over to watch Reagan. She seemed to do better with Grandma, although she was pretty drowsy all afternoon. She's probably slept a whole night's worth of sleep just in the naps she's taken today. I don't know what that means for tonight, but it can't be good. Please keep her in your prayers. It looks like everything is a go for selling our house. The inspection went well and they only made one costly request, a new hot water heater, which we agreed we'll pay half. Since we only have 2.5 weeks til closing, we're planning on moving in with my mom while we continue to look for the right house. It will be nice when we finally have a one story with Reagan's bedroom right down the hall from us. And I'm excited about being able to have a therapy room for her...with all of her equipment out and easily accessible. I can hardly wait. Now we just have to find the house. There she is cuddling up to Grandma. She wanted nothing to do with me! Words to live by. How can you feel weak and discouraged when He is with you? Makes sense, although sometimes it's easier said than done. I cannot even begin to describe the frustration and disappointment I'm feeling right now. I feel like our whole trip to Detroit was for not. I got an email today from the doctor I formerly respected basically denying everything they told us about the genetic testing they were going to pursue for Reagan. Telling me it costs $6000 per person (which it doesn't, they told us while we were there that it had just been lowered to $3000 per person) and that they don't have the funding to do the testing that's required on the three of us. I don't know why the change of events, maybe they forgot everything they told us, maybe they misspoke, maybe we misheard them (unlikely), maybe they thought we'd forget....I don't know. But right now I feel like every bit of hope I had been given, has been punched right out of me. I'm crushed. Totally crushed. I want to email him back and call him out on the lies he's trying to feed me, but I can't, can I? I'm just miserable about this. Miserable. Maybe Reagan could sense this coming because she's been crying all afternoon. She was in an awesome mood this morning (despite having a lot of seizures). So happy, grinning from ear to ear. Very alert with big smiling eyes (I wish I would have taken a picture). She had feeding therapy and she made it through the whole thing and then she started getting fussy right as we were leaving. By the time we got in the car she was full out screaming, which she continued to do nonstop all afternoon. She did finally have a dirty diaper, which usually helps, but the pain continued. She never really took a real nap. She'd cry herself to sleep but it wouldn't last for long, she'd either wake up as I tried to lay her down or she'd wake up from a seizure, either way screaming. Ugh. That sure makes for a long day. Thankfully my mom agreed to come over and watch her while Mike and I got away for a rare night out together to go to an Astros game. We drove all the way to the ballpark and were about to park our car when we realized, we left the tickets back at home. Just our luck. No really. We have some really rotten luck. We headed back home and decided to just go eat dinner and then head home. Reagan was asleep in Grandma's arms when we got there. Poor girl, she's had a rough day. And it all started out so well. Please keep her in your prayers. Another rough night last night. I'm not sure how much longer I can take these all nighters. Reagan has been going to sleep earlier than she used to, but we're still going to bed at the same late hour, so maybe we're compounding the problem for ourselves. I sure hope the Clobazam helps with Reagan's sleep woes. Our sleep woes. Although first and foremost, I hope it helps with the seizures. Still no sign of it. I'm hoping we'll get it by tomorrow so we can start it this weekend. Reagan has been in a great mood all day today. A real sweetie. She had three different therapies and was great for all of them. We're still waiting on the results of the inspection on our house, it's really the last thing that could interfere with the sale. Time is ticking away on our 30 day close but we can't start packing until we know it's a done deal. It's a little stressful and God knows we don't need any more stress in our lives. Hopefully everything goes smoothly. Here's to a restful & stress-free weekend. Doesn't she have the cutest profile?!?! Sleep is still the same. Not a lot of it. And Reagan had the same bad attitude this morning that she sported all day long on Monday. Luckily today it was only a half a day of it...although it was the half of the day when she was supposed to have two therapies. I say supposed to because she didn't do much except for scream and cry though her OT session this morning. More tummy pains. She finished the therapy session with a stinky diaper and then eventually cried herself to sleep. She woke feeling better but still cranky. She suffered through PT at noon but it wasn't her best work. I found a video today of one of Reagan's previous sessions with her other OT and I was SO impressed at how well she was holding her head up and bearing weight on her arms (while on her tummy and talking up a storm)...it really made me think. How she's not doing that at all right now. And I think it's the Keppra. It's amazing how these drugs, that are supposed to be helping our kids, often times do more harm than good. If it were helping reduce her seizures that would be one thing, but as we found out in Detroit she's still having boat loads of seizures! It's so frustrating that we're constantly changing medications (because nothing has ever worked) and with each medication change (up or down) it affects her...usually negatively. I just want something to work for this girl! I finally spoke with her neurologist today and filled him in on our trip (he's eager to see the actual results and talk to Chugani personally) and he's in agreement with taking Reagan off the Keppra and starting the Clobazam (whenever we get it). So tonight I started the Keppra wean, 1.25ml 3x day. Not nearly as aggressive a wean as I was hoping but for now I'll just go along with it. Who am I to say anything? I did ask him about a potential sleep aid but he wants to wait until we see how she responds to the Clobazam (it can make some kids sleepy). That would be a welcome side effect at night but not necessarily during the day. Lots of wait and see. Seizures have been rough again today so I'm glad we've come up with a game plan. Please keep our little one in your prayers. Reagan was up a lot again last night, but she has been in a much better mood today so it's made my life a lot easier. I've been playing catch up all day. I was able to schedule her upper GI with small bowel follow through for next Tuesday, bright and early at 7am. She's had one of these before when she was first diagnosed with seizures at 5mo and everything looked OK (although it did show reflux), but with all of the tummy problems she's been having lately her doctor thought it might be a good idea to check it out again. It will look at the basic architecture of the stomach/intestines just to make sure everything looks structurally sound. Over time things can change, so this is something we need to rule out (again). I still need to schedule Reagan's cataract surgery, but I haven't been able to get through to the surgery scheduler today. I'll try again tomorrow. I'm also trying to get the seating company we bought Reagan's Squiggles chair from to bring out some special needs strollers for us to try. The Squiggles chair is perfect to use around the house for therapies, but it's just too bulky (and doesn't have a sunshade) to use when we're out and about. I'm leaning toward something very simple and light, like an umbrella stroller. The two I really want to see are the Special Tomato Buggy Stroller (with liners) and the Maclaren Major. What's irritating is that we already have funding for this equipment but we've been waiting over 2 months now for them to get us a demo. I want to see it first to make sure it's actually going to work for Reagan. She is so difficult to manage now with her always wanting to go into extension (making her stiff as a board), it's almost impossible to hold her and she extends herself all the way out of our regular stroller. Hopefully we'll find something that is light enough for me and supportive enough for her so we can get out and do more. Right now we're pretty much hermits, never leaving the house except for doctors and therapy appts. Seizures seemed a little improved from yesterday, but then she woke from an afternoon nap and had a bunch that really knocked her for a loop. Poor thing. Still no word from her neurologist. So frustrating, it seems we can never get a hold of this guy lately! I'm hoping we'll get the Clobazam in this week so we can start it before the weekend. Please continue to keep her in your prayers. I'm finally there. Completely and totally exhausted. Maybe it's the fact that we're getting NO sleep at night because Reagan's waking up at least once an hour. Maybe it's the nonstop seizures she's having all day long. Maybe it's her super irritable behavior last night and all day today. Maybe it's the fact that I don't have enough time in the day to get everything done that needs to be done...running to and from therapies, scheduling of doctors appts and procedures, leaving messages for doctors (that I never hear back from), trying to get all of Reagan's medicine (and food) in her. Exhausting. Reagan has been such a handful today. She was fussy for OT this morning but she was full out hysterical for feeding therapy shortly thereafter. She was up last night with tummy pains which have continued to plague her all day. I did finally get a call from the GI nurse today and they scheduled Reagan's endoscopy-colonoscopy for July 28th. Not exactly as quickly as I was hoping. I just want to figure out what's causing her so much pain. No child should have to suffer this much. Seizures have been particularly rough today. Everyone is noticing an increase. Her feeding therapist brought it up and so did my mom. I, of course, already know this because I hold her all day long and feel each and every one of these nasty things wrack her little body nonstop. She definitely needs some prayers...that tomorrow will bring a better day. Reagan woke up a few times last night, and one time she needed her Daddy to get back to sleep. It just amazes me sometimes how she'll cry and fuss nonstop with me and then I hand her off to Mike and she just snuggles up and goes to sleep. Such a little turkey...this girl loves her Daddy! I wish I could say he had a super Happy Father's Day but after getting back from an afternoon of golf, he was hit with the symptoms of heat exhaustion. This hot, humid weather is brutal. Poor thing. He didn't even get to enjoy his Father's Day ribeye (so you know he was feeling lousy)! Before he left for golf, we did stop by a couple open houses. They were both pretty nice, but I don't think either were the house for us. I know we have a short amount of time to look, but this time we want to make sure we get everything we want and need this time around. Tomorrow the people that have an option our house are doing their inspection and we're hoping that everything goes smoothly. We've lowered our price so much over the last 7 months we're not really going to make anything on the sale of our house, so we're already at our bottom price. Frustrating, but it's time for us to move on. Speaking of moving on, I'm calling the neurologist to talk with him about our recent findings in Detroit and to see what he thinks about the effectiveness of the Keppra. If all of those twitches she's having are really seizures (like the VEEG indicated), then she's really having upwards of 1000 seizures a day. Scary. We're still planning on adding the Clobazam per Dr. Chugani's recommendation but we probably won't get it until Friday at the earliest. We definitely need to make some changes. Something just has to work for this little one! Please keep her in your prayers. Last night we gave the melatonin another try (only this time 6mg). Reagan went to sleep early but then woke up again long enough for me to give her a dose. I'm not sure if it helped or not. It certainly wasn't a full night's sleep but she did go to sleep fairly quickly after getting the dose and then she slept about 4hrs or so. I wanted to try it again tonight but she fell asleep before I could give it to her. Hopefully she'll sleep without it. She's been quite the handful today. Very fussy and whiny most of the day. Then this afternoon we couldn't take it anymore so I gave her a suppository and that helped clean her out and afterward she seemed much improved. I think we're going to go ahead and schedule the endoscopy and colonoscopy for her. Things are still not right with her tummy even with the switch to soy, we need to get a look in there and make sure everything is OK. I hate the idea of more procedures, but we just have to get to the bottom of what is causing her so much pain. There are a lot of unknowns right now, hopefully we'll get some answers in the near future. Please continue to keep her in your prayers! Last night was a fairly good night for sleep. I don't think I mentioned it, but we did discuss Reagan's sleep (or lack thereof) with Dr. Chugani during our visit. He suggested trying the high 6mg dose of melatonin. He said that sleep issues are very common in kids with infantile spasms because they are unable to get into a regular sleep pattern (makes sense if they are having episodes of hypsarrhythmia at night like Reagan). He said that if the melatonin doesn't work then we may want to try clonidine at night (something our local neurologist already mentioned). So we'll see. We hate adding anything else to Reagan's already full medication schedule, but if it will help her sleep, it would be beneficial to us all. Today we slowly got back into the swing of things. 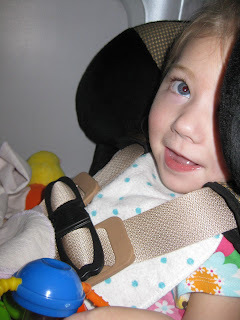 Reagan only had one therapy, feeding therapy, and she was very cooperative allowing her therapist to do all sorts of stretches without so much as a peep. She also ate a little applesauce and took a few pretty good bites. It's all a matter of timing with her. You have to be patient but if you get it in there at just the right time, she'll take it off the spoon and swallow it down no problem. Seizures have been a little rough today. I'm ready to try something new. I'm a little unsure of the effectiveness of the Keppra. Initially we thought we were seeing improvement because although she was having more "twitches", she was having less of the typical spasms. Now that we know the twitches are seizures too, I'm not sure how much the Keppra is helping, if at all. I spoke with the Canadian pharmacy today and they shipped our order of Clobazam. It will probably take a week or so to get it, but we can start it as soon as it gets here. As far as Canadian drugs go, it's relatively affordable (especially when compared to Vigabatrin) which is good since insurance doesn't cover it. Reagan had a scary episode tonight and I'm still not sure whether it was seizure related or just a long breath holding episode. Mike was holding her while I took a shower and when I got out I could hear her crying and then nothing. All of a sudden I heard him yelling her name over and over again, I ran into the room and there she was stiff as a board, totally purple and not breathing. Finally she came out of it, but I could tell Mike was visibly shaken. It's scary. We have no idea what brought it on. Maybe tummy pains? Maybe a seizure? Who knows. This girl, always keeping us on our toes. Hopefully we won't see another one of those for a while. Here's to an uneventful weekend at home. So much for the drowsiness, it passed rather quickly and Reagan woke up quite a few times fussing last night. Thank goodness we got that nap or we would have been exhausted today. I have to say overall I was less than impressed with Children's Hospital of Michigan. I had heard wonderful reports from other parents of people going above and beyond...maybe my expectations were just too high...but I was not impressed, that is not until today. Today we had our appt with Dr. Chugani. First we met with another doctor and he got a detailed history from us (which he then recited by memory to Chugani- very impressive) and told us the results of the VEEG and PET scan. Nothing hugely surprising. The PET and the EEG showed very generalized seizure activity all over the brain...no chance of surgery. The PET showed a hypometabolism of glucose (her brain was not metabolizing it well at all) in all areas except her visual cortex and a portion of her motor cortex. The EEG did show intermittent hypsarrthymia (more so during sleep) as well as an overall slow background. One interesting find is that the "twitches" she's been having, the ones that she has a lot of but we weren't that worried about because we didn't really think were epileptic, yeah they are. So she's having WAY more seizures than we thought. Not good. So at this point we're a little disheartened. Then Chugani comes in. He immediately started putting things together. The stiffness in her arms and legs, something we've been calling spasticity, he thinks is actually dystonia. Then the fact that she had cataracts. And of course Infantile Spasms. He thinks it's all genetically linked (which is nothing new, we've heard this all before) but the catch...he is very insistent on finding out what it is! For the sake of us, so we know whether or not we should have any more children, he wants the tests done and he wants them done now! He even brought in the geneticist and all three doctors had a quick brainstorming session right there in front of us. It was interesting to watch. They decided to take a sample of blood from us all to run tons of genetic testing...all very expensive but free of charge because they will be doing it as part of their genetic study on infantile spasms. Very neat. He also thinks she needs to try another seizure medication, Clobazam. This is one that was recommended to us by our neurologist but we were afraid to try it because it is from the same family as Klonopin. Apparently it doesn't have any of the nasty side effects of Klonopin and he thinks it might work better for Reagan (and also help a little with the dystonia). We're going to add it on top of the Topomax and the Keppra. It's another one of those drugs only available in Canada, so now we begin the process of trying to get it in our hands in the US. So that's it. We have a plan of action. A new medication to try and lots of genetic tests to run. It's all in their hands now. And they are very capable hands. All in all I would say the trip was a success and we're glad we did it. The flight home went surprisingly well too. Reagan was great. The only mishap was that she had a super smelly dirty diaper halfway into our flight and we had to change her right there on the seat! No changing tables! At least we were at the very back of the plane...but it was quite gross. AND when we got home we had an offer on our house! We made a counter offer and they accepted! We've gone almost 7 months with no offer and POW it's done. It's almost more stressful now that we know we have to move. Please say some prayers for us on this. We are quite stressed about it, we have a 30 day close and no leads on a new house. Thank you for all the prayers during our trip but please keep them coming as Dr. Chugani continues to research Reagan's history and genes to try to uncover the root of her problems, as Reagan starts yet another new medication, and as we try to find a new house that fits us. Mike took the first "shift" last night from 11-3. I had a hard time falling asleep, thinking someone was going to come in and make me get out of the bed next door. I finally fell asleep sometime after midnight. Of course, Reagan slept the entire time (during Daddy's shift). Then I got up at 3am and she woke maybe 5 min later. I was able to get her to drink some of her bottle though, which was good because she had to stop all food/formula at 8am. She had quite a few seizures during her time up and finally fell back to sleep around 4:15am. She woke again around 6:30am (Reagan's best night of sleep in a long time) when the nurses started coming in to prepare us for discharge. Prepare us for discharge? Wasn't this supposed to be a 24hr EEG?? Apparently that's not a literal term. I guess if you have a child that has very few seizures then they might keep you longer but since Reagan had more than enough (she had a good day yesterday with just a few here and there but this morning she more than made up for that) they were ready to get rid of us. And the fact that they had the room booked up probably played the biggest role in them kicking us out at 8am. The only problem...Reagan had to keep the EEG leads on her head for the PET scan (which wasn't scheduled until 1:30pm), so we couldn't just leave the hospital. We were stuck. Apparently they usually schedule the PET scans in the morning but for some strange reason they mucked this up (just our luck). Thankfully, the people in the the PET department were the nicest we dealt with during our stay and they gave us a room with a tv to just hang out in for the next 5.5hrs. About an hour before the procedure they started an iv and Reagan was not too happy about that. 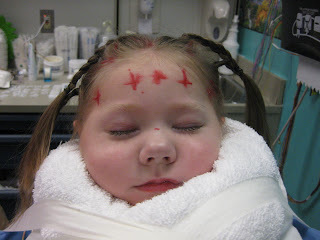 Then finally at 1:30 the EEG technician performed a 30min EEG and when he was finished he proceeded to rip the EEG leads off her head...lets just say she was not at all happy about that. Then they moved her to the PET scan and gave her some iv sedative. She responded really well, she just started drifting off and they only had to give her the one dose. The scan itself only took another 20min or so and then they came to get us and we cleaned her up and washed her hair while she was still out cold. They told us she would probably be groggy for a while so we high tailed it over to the hotel to take a nap! We went ahead and got a room at a real hotel, the Greektown Hotel and Casino, only a couple miles away from the hospital. We walked in and it was love at first sight. Big fluffy comforters on the bed, everything nice and new, it was heaven. We all took a good 3hr nap and then we woke Reagan up so I could feed her. She drank a big bottle very quickly and woke up in a great mood. She's still a little groggy but very sweet and happy. I love that sedative! Could we get some to go? Now we're just hanging out in our room. We got some Greek takeout and it was delicious! Apparently this is a highly populated Greek part of town (hence the name Greektown) so the food was authentic Greek and oh so good. Mike is dying to go to the casino but I'm hoping to talk him out of it. Nothing good could come out of that! So tomorrow is our big day with Dr. Chugani. We'll get the results of all the testing and his expert opinion on Reagan's situation. Please keep this in your prayers as well as a safe and problem-free flight home. I wish I could say everything went as smoothly today as it did yesterday. None of us slept more than a wink last night. It was hot and uncomfortable and Reagan kept us up all night. We checked out of our room and headed over to the hospital shortly after 9. In the few short seconds we were outside...boy was it nice. So cool and comfortable, a polar opposite to Houston's hot, humid weather right now. 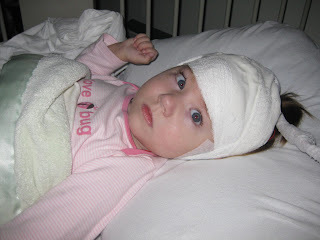 We first went to admitting, which didn't take too terribly long and then they escorted us up to the EEG dept. We waited there for quite a while and when Reagan was already getting a little antsy by the time we were called back. 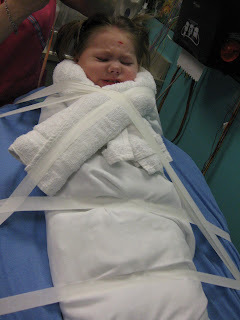 They wrapped her up like a mummy and she HATED it! Cried and cried. I had to take a picture because she looked so cute and so pathetic at the same time. It seemed to take forever (they do go through the trouble of braiding her hair to keep it from getting too gunked up) and finally Reagan wore herself out with the crying and fell asleep at the very end. Then we were taken up to our room for the video EEG...which was already occupied by another family. To clarify, there are two rooms with a half wall in between them that leads to a shared bathroom. Some privacy, but not nearly enough for our super sensitive princess. Luckily they cleared out in the afternoon and now we're in here alone. 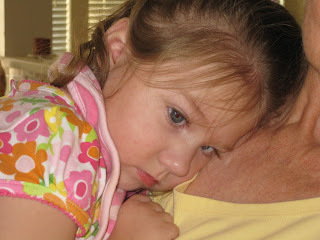 Reagan has been fairly irritable today...which is double tough when you can't really move around at all with her. I think it's a combination of all the junk on her head and not taking a decent nap all day. Every time she falls asleep on us and we try to make the switch to the crib, she wakes up crying. She's so tired, you can just tell, those eyes have had a hard time staying open. We're tired too. I really don't know how we're going to do it tonight. They say that one of us has to stay awake 24/7, but we are both so sleep deprived I don't know how we'll manage that. I guess we'll probably try to take shifts, with one of us sleeping on the empty bed next door (they didn't say we could do that but we're hoping they'll let us) and the other in with Reagan drinking coffee. It's going to be a long one (but aren't they all)! Seizures have been fairly mild today...it's been 9hrs and we still have the same log sheet (although we only have 2 spaces left). I'm interested in seeing what they have to say about the results of the EEG on Thursday. The highlight of our day today was when we ordered pizza tonight! It was a place recommended by Meghan after all the time she spent here with Jackson in the hospital and it was awesome! 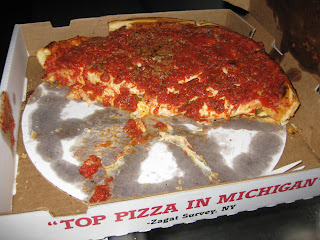 My first taste of Chicago style deep dish pizza and it was so yummy but so rich. I'm stuffed. It's been a stressful day and it's only going to get worse tonight and tomorrow. She has the PET scan tomorrow which requires sedation, which is always a little worrisome. Not to mention the fact that she can't have anything to eat after 8am. It's not like she typically gets "hungry" but her bottle is what we use to soothe her when she gets fussy. Should be an interesting day tomorrow. Please continue to keep her in your prayers! We’re here! Everything went surprisingly well. Reagan was a dream on the 3hr plane ride. 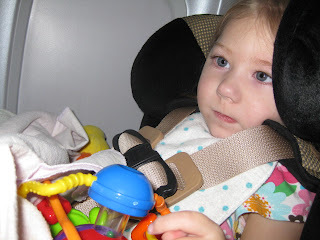 We did have a few issues trying to get her carseat installed (since she’s over 2 and can’t sit on her own we had to put her in her carseat for takeoff and landing), but we eventually figured it out. Reagan has been super talkative today. She was pretty quiet on the plane but started up again right before we got off. What’s funny is that as we were exiting the plane several flight attendants commented on how sleepy she was (even though she was wide awake and babbling away on my shoulder). They just couldn’t get over how “out of it” she was! We just had to laugh about it…but I wonder how many parents would have been put off by that. At what point do you educate people and tell them that your child is not sleepy or out of it but she’s disabled and visually impaired? I don’t think I’m ready for that yet. Let me tell you, it’s not easy lugging around this child, her carseat, and our luggage. Thank God we bought one of those go go kidz pull carts, it attaches to the carseat and you can pull it through the airport with ease. It did take a little extra time to attach it and unattach it, but it was a life saver. After getting our luggage, we headed off to get our rental car. It took forever but we finally got a car and made our way toward the hospital. We stopped on the way and ate an early dinner and then checked into the International Guest House. You know the saying; you get what you pay for? Well that about sums it up. The A/C is broken, the refrigerator wasn’t working (turns out it was just off), the pillows are the super thin, plastic kind and the hallways smell like smoke (even though it's nonsmoking). All I can say is yuck. I don’t know if we’ll be staying here another night. Tomorrow night we’ll be in the hospital, so I’m thinking maybe we check into a real hotel on Wed our last night here. I was all for saving some money by staying here, but an A/C is something I cannot live without. We’re all super tired, so I’m just hoping it will cool down a little so we can get some sleep before heading over to the hospital tomorrow. Thanks for checking in on us and please keep the prayers coming! Monday June 15th- we leave Houston on Continental at 10:20am (our first flight ever with Reagan) and get to Detroit by 2:23pm. We got 2 out of 3 tickets free through Continental Careforce. They help children get the medical treatment they need by providing free flights for the child and one parent (once a year). It was a huge help in making this trip happen. I decided to go ahead and get a rental car because the taxi cab fares are so steep we'd only have to spend a little more to get our own car for 3 days. We're staying at the International Guest House next door to the hospital. It's similar to the Ronald McDonald House in that it offers reduced rates for families of kids receiving treatment, but it's a little nicer and you're able to make reservations in advance. Tuesday June 16th- we check in for Reagan's 24hr video EEG at 9:30am. That is an overnight test. They hook her up to all the leads and then monitor seizure activity for a full 24hrs. We have to press a button each time she has a seizure...that's going to get old quick. She's probably going to get irritated of having to lay in the hospital bed 24hrs with junk stuck to her head and our patience may get tested a little. 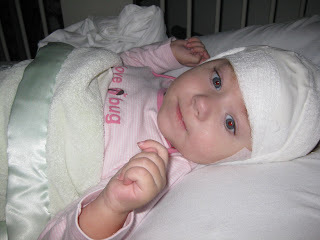 I'm just hoping that maybe we'll see some sort of improvement in her EEG...she hasn't had one since October. It sure would be nice to see less or even better NO hypsarrhythmia!!!! Wednesday June 17th- after she finishes with the EEG, they will leave the leads on her head and we'll go straight over to have her PET scan done at 1:30pm. She's never had a PET scan before...this is the real specialty of the doctor we're seeing in Detroit. They will sedate her and put some sort of radioactive dye into her and then monitor how her brain metabolizes it. This may give them some sort of insight as to what is at the root of all of her problems (we're hoping). It may also see more clearly if there is in fact a seizure focus in her brain that could potentially be removed by surgery. Thursday June 18th- 10am we meet with Dr. Chugani for the results. This is going to be the most nerve wracking part of the trip. We're hoping and praying that he'll have some good news for us. Then we leave Detroit on Continental at 3:08pm and get back in Houston at 5:07pm. I also plan on updating the blog while we are there, so that will be a good way to find out how things are going and the most urgent prayer requests. Thank you all for your support! Reagan went to bed early last night around 9pm, I had just enough time to get all of her medicine in her but not enough time to give the high dose melatonin a try. Maybe tonight. She went all day without taking a nap, just a 5min siesta here and there. We went to church tonight and she was very well behaved. She had actually just fallen asleep right before we picked her up (and woke up as soon as we put her in her carseat). The woman that watches her at church commented on how few seizures she had. Now that I think about it, I guess this was the first time we've been since she started Keppra. That's definitely a good thing when other people notice a difference. It's hard for me because I'm still seeing her have a good amount in the middle of the night and first thing in the morning. Baby steps. Still haven't done any real packing but I did make a dent in the laundry, so that's good. I decided to go ahead and get Reagan one of those hand held DVD players after seeing how mesmerized she was during her gastric emptying scan watching those cartoons. I figured maybe it will help to entertain her on the airplane or while we're cooped up in that room during the 24hr EEG. They sent us a packet in the mail that outlined the expectations for the EEG and I'm not sure I'm up for it. First of all, they want a parent awake at all times (including night) to press the button and write down in a log any "events" she's having. I don't mind pressing the button, but I'm not sure I'm going to jot down all 100+ events. They also say that you can't have a personal computer in the room. I figured we'd spend half our time on the internet, so what now? And how am I supposed to do the blog? I may have to sneak away for that. Any way you look at it, it's going to be a stressful trip and I'm sure we won't relax til we're back home in TX sleeping in our own bed. Only one more day til we leave! Please keep us in your prayers! Today has been a little hectic. We had two showings for our house...to the same people. We're hoping maybe they'll be the ones. Somewhere in between all of that we were able to squeeze in a couple sessions of OT and vision therapy. Reagan has been a little fussy today but managed to do well during both therapies. Sleep is still exactly the same...no need to dwell on it (I've done enough of that already). Since Reagan's switch over to soy I've been a little concerned about her taking in less calories (since I stopped adding flavored syrups to her bottles). She just feels a little more bony lately (especially in her back). So I went ahead and ordered some benecalorie and I figured I would just add some in here and there to her food. I gave her some last night and some this morning...but this afternoon when I was on the phone with the nutritionist from the GI dept, she mentioned that she thought benecalorie had milk in it. Yep, it does (it's only the second ingredient). Great. So much for that. She said that instead we could just try adding a tsp of vegetable oil to her food (40 calories). Doesn't sound very appetizing, but it may be our only option (other than adding back all of those sugary syrups). One piece of good news I got today, I think we are going to be able to get Medicaid to cover the cost of her soy formula. Since it's Reagan's main source of nutrition, they will pay for it. They do not, however, cover anything that is considered supplemental nutrition. Interesting. You really do need to take a class on getting to know the ins and outs of these government assistance programs. No one explains any of it to you and I've found the only way you hear about many of these things is from other parents of special needs kids (who have already been through it). It's amazing how expensive it is raising a child with special needs. It all adds up and it adds up quick. It's a different life, certainly not the life I planned or the life I would chose. But I cannot imagine loving Reagan more and there is nothing we wouldn't do for her. She's our little princess and she's perfect in our eyes (although we would appreciate less seizures and more sleep). Sleep, well I don't think I even need to mention it. It's pretty much nonexistent at this point. Every night Reagan is up and down nonstop until about 4-5, then that last little stretch she'll get in a solid 1-2hr and then she's usually up by 6:30 or 7am. Same thing every night. We're like walking zombies around here. Last night I did increase the B6 (from 25mg to 50mg) but we didn't see any improvement. I just don't know what is waking her up...is it nightmares, seizures, stomach pains??? I have no clue. I do know yesterday I was holding her and she had been asleep for about 5min or so and out of no where she threw herself into a ball and started screaming. She was screaming but not making a sound, her face was all red and her mouth wide open but nothing was coming out, she held her breath until she turned totally blue and could hold it no longer and then the real screaming started up. But there was no warning, no seizure, no gas, I don't know what it was but whatever it was just hit her all of a sudden and I have a feeling that's what's happening every night, all night long. I spoke to her neurologist today and he wants to see if the increase in B6 helps. If not then we may try an even higher dose of Melatonin (6mg) and if that doesn't work, then we'll just figure it out when we get back from Detroit. Her doctor thinks it's probably all related to taking her off of the Klonopin and he mentioned possibly trying Clonidine or Ativan sometime in the future but now is not the time to be adding new medications (even if it means more sleepless nights for us). Sophie's mom recommended trying Neurotonin, since it was the only thing that helped her sleep, but when I asked our neurologist about it he said he's concerned that it would only aggravate Reagan's myoclonic seizures (since she tends to be sensitive to drugs that have that side effect). So that's that. More wait and see...which is hard to do when you're so sleep deprived. Maybe Dr. Chugani will have a suggestion next week. I hope so. She has been a little congested the last few days. Originally I just thought it was from all the crying she's doing at night, but it doesn't seem to be going away during the day. It sounds more like spit accumulating in the back of her throat than real congestion, but it's hard to tell. Reagan's eye appt went well enough today. Her cataract surgeon said that there is definitely an opacity on that left eye. She can still get a red reflex (which means she can see to the back of the eye), so she's not super concerned about it, but it will have to be removed. She said it will probably get worse, it's just hard to say at what rate. If we have it removed within the next month or two, it should be fine. So she pretty much left it up to us to schedule the surgery when it's good for us. Personally, surgery is never good for me (especially 4 cataract surgeries) but whatever. I just hope and pray that this will be her very last one! Enough already. Another terrible night last night. Lots of screaming and crying...most of it done by Reagan. She was still in a bad mood this morning, fussing and fighting against me, I was seriously at my breaking point. Sometimes it's just more than you can take (by you, I mean me). The combination of tons of seizures and irritability is difficult to deal with, but when you're going on NO sleep, it's almost impossible! I spoke with the neurology nurse this morning about Reagan's lack of sleep. She said the doctor recommended Melatonin. Thanks, but we've tried that. I'm wondering if the irritability and constant waking up at night is related to the high dose of Keppra and the relatively low dose of B6? I asked her about that and she was going to ask the doctor, but I never heard back. I went ahead and increased it to 50mg tonight to see if maybe that helps. I also increased her morning dose of Keppra, as the doctor recommended. Now we wait to see if anything changes. Please keep her in your prayers. Reagan's been off and on fussy all day today. She was in a good mood for PT, although she refused to keep her head up. It's so crazy how one part of her body can be so floppy, while at the same time her legs and arms are so tight. I'm trying to get her into an aquatic therapy program at Texas Children's. It's a 10week program (that doesn't start til mid Sept, but they are enrolling people now) where she would get PT in the water. I think it would work really well for her because when she takes a bath it's one of the few times she actually relaxes all of those tense muscles. We'll see. I haven't heard back from them yet. I did finally hear back from the GI doctor on the results of the gastric emptying scan. She said that Reagan's emptying is delayed (boy we hear that word a lot) but it's not super slow. It's kind of in that gray area where you don't really know whether or not to treat it. In a healthy person, one half of the stomach contents should empty in 90min, based on what they saw it would take her 117min to get to that point. So what now? We're going to see how she responds to the switch to soy. Meanwhile we're going to schedule an x-ray of the stomach and an endoscopy (which probably wouldn't happen until sometime in July)...if her tummy pains go away on the soy then we'll just cancel those appts, but if not at least we have them scheduled. Tomorrow we have a super busy day, an appt with her cataract surgeon who has been on maternity leave to check the status of the secondary cataract in her left eye and then three different therapies. Should be fun. Thankfully I have some summer help starting tomorrow so I won't be running around like a chicken with it's head cut off. I decided to hire the niece of a friend, she's a college student and would only be here for the summer, but at least she comes highly recommended and I can spend the next couple months taking my time looking for a long term helper. I just didn't want to rush into anything again. Brutal. Last night was another horrible night. Reagan would wake screaming every 5-20min. I was up and down the entire night. Tons of twitches, tons of seizures...how could anyone sleep like that!?!? She did manage to get a good hour or two of solid sleep at the end but that's not enough for anyone to get by! After such a rough night, I did go ahead and increase her Topomax back up a little to 4.5pills 2x/day...maybe we'll see a little relief with that. I spoke with someone from the epilepsy clinic today (some new person that knew nothing about Reagan) and they said that her doctor wants to continue increasing the Keppra. If the last increase made things worse, sure, why not increase it again! That makes a lot of sense. So now we're supposed to increase the morning dose to 1.5ml in the am, 1.25ml at noon, and 1.5ml in the pm. We'll see how that works. Lots of prayers needed! Reagan had another session of Feldenkrais this morning and she did really well. Even without sleep, she was in a great mood and very cooperative to everything the practitioner was doing. This afternoon she took a nap and slept straight through vision therapy. I always say that Reagan has the cutest bottom and now there's really no doubt about it! I found the cutest pair of bloomers ever! 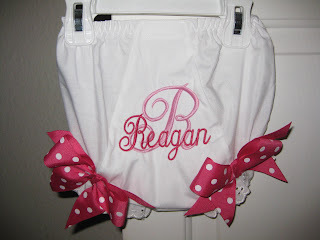 I fell in love with the picture of Lily and her little sister in matching monogrammed bloomers on Lily's old blog and I decided that I had to find a pair for Reagan. Not only did I find some, but they are just gorgeous! I contacted the lady about making a pair for Reagan and after seeing Reagan's blog she insisted on doing them for us free of charge! SO sweet! You can pick from tons of fonts, colors, and ribbons making each one completely original and adorable! I just love them and can hardly wait to get a picture of Reagan in them! Still no success with the Melatonin. Reagan was up and down a lot of the night last night. She slept from 7pm-12:30am, but after that she was up at least once an hour. Of course she did have two dirty diapers last night so that might have played some role in all of the waking and fussing. We were trying a higher dose of Melatonin, since the first time we tried it the 1mg pill seemed to have no effect whatsoever. Now we're using a 3mg pill and still not seeing any benefit...if anything she's sleeping worse! I just think if she were going to respond to it, it would have been immediate. I think tonight we're going to skip it. Maybe she needs a higher dose? But 3mg is already pretty high, so I don't know about increasing it further. Maybe I'll call the neurologist tomorrow and ask him about it. I already have to call and ask them what we should do next with the Keppra. Seizures have been frustrating lately for us and for Reagan! Sometimes they'll wake her when she's sleeping and other times they are the reason for her whining/fussing...because she'll calm down as soon as she has one. Ugh. I hate these things! Maybe after all the testing in Detroit, Dr. Chugani will have a better idea as to which medication would be more effective in stopping these nasty seizures. That's what we're praying for anyway. This poor girl has had NO relief! This afternoon she's been a little off. Very groggy and very fussy. She'd fall asleep then wake up 15min later screaming. She's starting out of the sofa tonight. Please keep her in your prayers. So much for the melatonin. Reagan was up a lot last night and she's been up pretty much the entire day today (I wonder if it can have the opposite effect). We're still going to give it a couple more nights to see if it works, but so far, not so good. Despite the lack of sleep and the huge amount of seizures/twitches she's having, Reagan was in a pretty good mood this morning. That is, until we got to late afternoon without any hint of a nap. She fell asleep right before we left for the Epilepsy benefit at Rajun Cajun and woke up the second we put her in the car. That made for a very fussy little girl. And even though we were inside, she was getting very hot and flushed from of all of the crying. She finally settled down and slept about 15min or so in my arms, but that was it and it wasn't enough. We were there long enough to eat and socialize a little but Reagan was not being very cooperative. It's funny, our neurologist's nurse was there selling the raffle tickets for the Harley Davidson. Maybe Mike will win...he did buy two tickets. I'm glad though, there really seemed to be a good turnout! We were there at 3:30, probably the least busy part of the day, and it was super crowded and they had already sold nearly all the raffle tickets. It was all for a good cause. Reagan did not go down for a real nap until after 7pm, which I'm sure spells disaster for our sleep tonight. And once she went down, she was OUT! Finally around 9pm we picked her up out of bed and tried to wake her. It didn't happen. So I fed her a bottle and gave her all of her medicine in several spoonfuls of food while she continued to sleep. I changed her diaper and put her to bed around 11pm and other than a few stretches here and there, she really never got close to waking up. I felt kind of bad giving her Melatonin when she was already so out of it, but it's worth another try. It sure would be nice if we could find something that would help her sleep at night again! She really only slept through the night for a few glorious months, and we have wracked our brains to try to figure out what was her winning recipe for sleep. Mike thinks it was the Vigabatrin, I think it was more likely related to the Klonopin, but who knows at this point. We're just grasping at straws, we're so desperate for a good night's sleep right now. Please keep her in your prayers...less seizures and more sleep! What a horrendous night last night! I didn't realize how dependent Reagan has become on that little sip of koolaid or whatever to get her back to sleep at night. She was miserable without it. Fussing and moaning and groaning and screaming and crying...she was driving me crazy! I felt bad because she was having a TON of seizures and I know that had to be upsetting her, but there was just no snapping her out of it! At this point, I was very worried about how she was going to do for the gastric emptying test. She finally went back to sleep around 4:45am and then slept til 6:30am when my mom came in and woke her up with the alarm. Reagan didn't mind, she was thrilled to see her Grandma first thing in the morning and I was glad to have help. Little turkey, it was hard to believe that she had been such a terror during the night. When we got to the hospital to run the test, the guy tells me that Reagan has to drink 2oz in 5min. I think I actually laughed at the idea! I don't know if Reagan has EVER drank 2oz in 5min. Then he says that she can take up to 10min but that's it, no exceptions. If she can't do it, they'll have to cancel the test. So he leaves and comes back with her bottle full of soy and radioisotopes and it's actually 3oz!! I admit, I had no faith in her being able to drink 3oz in 10min...but we thought we'd try. Well, needless to say, she proved me wrong. She drank the 3oz in about 8.5min. Then he laid her on the table on this foamy board and proceeded to tape both her arms and legs down flat against her sides. First of all, she prefers to keep her arms bent, so I really thought she was going to break free but she tolerated it just fine. She not only tolerated it, but she was awesome! I turned on some cartoons and put the little TV up close to her and she watched those cartoons nonstop for an hour and a half! I could NOT believe it. It was amazing. Not only was she totally content, she was actually watching the TV and following it with her eyes! It was seriously her best behavior to date! She never got antsy, not even once! Then when the test was over, they cut her loose and I was finally able to give her her seizure medication...not that it's helping. I can't believe we've actually seen an increase in seizures (and especially twitches) since that last Keppra increase! It just doesn't make sense! Maybe it's just the fact that we're making changes, who knows. So frustrating! No news on the results of the test today. They said the doctor would read it today but probably not get back to us until Monday. Not surprising. Anyway, I am SO exhausted. My eyes are all bloodshot and sore from being up all night. I'm giving the melatonin another go tonight. We're going to try a higher dose 3mg. Before we tried 1mg and we saw no difference. Maybe this will work? Some sleep would be great! We sure need a nice relaxing weekend. Hopefully we'll get one. We're planning on going to a fund raiser tomorrow benefiting "Kids with Epilepsy" at the Sugar Land Rajun Cajun. It was something I just heard about and decided we had to attend (for obvious reasons). Hopefully Reagan will behave so we can have a good time. Anyone in the area please come! It's from noon-10pm Saturday June 6th. So much for increased sleepiness from the Keppra increase (at night anyway). Reagan woke up only 2hrs or so after I put her down for the night. And then it was the same old story, up and down the stairs until I finally caved and transferred her to the sofa. So far, no changes noted from the increase (except maybe a little more sleep this afternoon). She woke up this morning very twitchy and having the usual amount of seizures. I did finally talk to the neurology nurse who confirmed that the doctor wanted to increase the Keppra exactly as I had already done. I'm surprised because I thought I was being a little cautious...I really thought he'd want to go up higher. She said for us to watch her over the weekend and that if we were going to see improvement we should probably see it in the next couple of days. Please keep that in your prayers! Reagan seems to be doing well with switch over to soy. Today was her first full day of soy. I wouldn't say she's guzzling it down like she did with that first bottle, but overall she seems to be drinking a little more of it. First thing tomorrow morning we're going in to Texas Children's for a gastric emptying scan. Her GI doctor thinks that she may have slow motility which could be responsible for her lack of hunger. Hopefully it will yield some sort of insight into her extensive tummy issues. The problem is, she can't have anything to eat or drink after 2am in the morning...so if she wakes in the middle of the night (which she does often), she can't have any koolaid to calm down. We're on our own. Should be fun. Reagan woke in a fairly good mood today. She slept slightly better last night and was very happy and cooperative this morning during OT. She took a bath and seemed happy as can be. I was blow drying her hair when it hit her...the infamous tummy pains. Out of no where, Reagan just started screaming bloody murder! She cried and cried and cried. I did my best to help her "work it out" but I felt a little helpless. Finally she had dirty diaper, screamed lots more, and fell asleep. I admit, I breathed a sigh of relief thinking we were out of the woods. Too bad she woke up in the same foul mood. She was having lots of seizures (and twitches) and still full of gas. When PT arrived she was still very fussy, but Reagan allowed her to bend and stretch her in an attempt to get the gas out! It must have worked because shortly thereafter Reagan was able to relax and fall back asleep. Ugh. I'm so sick of these stomach pains. No child should have to suffer like this. I'm glad I decided to order the soy formula myself because it arrived today and I plan on starting her on it ASAP. Ever the skeptic, I'm not sure if it will work, but at least we're trying something. She was still a little fussy after she woke up, but she cheered up just in time for Daddy to get home. Always good for Daddy. I decided to go ahead and start the soy tonight and Reagan loved it! She drank down that 4oz bottle in no time! I'm wondering if it was just because it was something new or if she actually liked it. I didn't even have to add hershey's syrup to it...although if I stop the syrup I'm going to have to find another way to get 250 additional calories into her. But if she actually likes it, maybe I can get her to drink more of it. We'll see. I know I'm getting ahead of myself, this was just the first bottle. Of course my main hope is that this change over to soy will put an end to these horrible tummy pains we've been dealing with. Please keep that in your prayers. I'm still waiting to hear back from her doctor about increasing the Keppra. I decided to increase tonight's dose by a little (0.25ml) to see if we see any change. I have a feeling the doctor will tell me to increase it further, but at least we're on our way up. I would love to see some seizure improvement and sleeping better at night would be a nice bonus. Reagan was up a lot again last night. She was up and irritable...not a good combination when you are exhausted in the middle of the night. We had an appt with the Feldenkrais practitioner this morning and I was afraid we might have to cancel it because of her nasty mood. But Grandma came over and Reagan perked right up. I was very impressed with this lady...a huge step up from the ABM practitioner we saw in Austin who seemed to not do much of anything. What's funny is she was doing some of the same stuff but in a more practical and fast paced way (less pausing for Reagan to "integrate the information" and more doing). In my opinion, what she was doing more closely resembled the videos I've seen of Anat working with children. I went in pessimistic and came out pleasantly surprised. Reagan did awesome and couldn't have behaved better. She had Reagan completely relaxed laying on her side, knees bent (including her right leg which she hates to bend), back flat and no extension whatsoever. I was impressed with that alone. She also did some stretching with her hip/pelvis that really helped her to stop arching her back against the floor and lay flat. She worked her from head to toe. I think this is something I'd like to continue with, at least for a little while to see how Reagan responds. I'll probably try to fit another session in next week before our trip to Detroit. We went out of our way to go do those first four sessions in Austin and we probably should have just tried this lady first. Oh well. I have noticed that Reagan seems to be much more visually attentive lately (I think since those sessions but Mike thinks before). When you talk to her or she sees you out of the corner of her eye, she'll turn and look right at you, something she rarely if ever used to do. Lots more eye contact. She won't hold it for too long, but it's a noticeable improvement. After the morning session we came home and Reagan had back to back sessions of PT and vision. Poor thing. I think 3 sessions in a day is just too much. Therapy overload. She did finally go down for a nap afterward, her first real nap of the day. I'm hoping the lack of sleep today will help her to sleep more soundly tonight, although there's not always a direct correlation. What I have noticed is the less sleep I get, the more obsessed I become about getting sleep. When Reagan was sleeping through the night, we were all beyond thrilled, but we didn't dwell on it like we do now. Please pray that we'll get some relief in this area soon. Sleep was improved last night. Was it the classical music I had playing, in addition to her regular rainfall background noise? Probably not, but it was nice. Reagan woke up around 4am and I brought her downstairs where she proceeded to have lots of seizures and resist going back to sleep. She seemed content though, so I laid back down and a few seconds later she'd start fussing. This went on for a while until I gave her enough koolaid to quench her thirst and she finally fell back asleep. For us, that was a good night's sleep. Then drama first thing this morning. Our newly hired helper was a no show. Not surprising. She's been calling in sick on a fairly regular basis and then emailing me last minute to tell me she wouldn't be coming in. I checked my email and there it was, her concession speech. She was only working for us for about two months but she missed often. We wanted someone dependable, who could be flexible with our schedule and apparently she wanted the same thing. It's unfortunate because she seemed to genuinely care for Reagan. I think the problem was she was just too young. Not ready for this or anything that resembled a real job. I guess the search is on for someone new, hopefully we'll find the right person this time. Please keep that in your prayers. That was just the start to our day. Reagan had OT (at home) and then feeding therapy & OT (30min away). She was in a really great mood today, so that made everything a lot easier. I decided to go ahead and decrease her pm dose of Topomax back down to 4 pills (60mg)...increasing it didn't seem to help her seizures and it just increases her chance for acidosis. Next step will be to increase her pm dose of Keppra. I'll probably consult with her neurologist on that one (since she's already on a very high dose). I'm so sick of the constant guessing with medications. Why can't we just get something to work for her? As always, prayers needed in that area.